Join us to our market adventure in San José, Costa Rica!! The Workshop consists of getting to know the most intimate issues of a place through analytical and creative sketches, focused on the relationship between space and people. The Central Market of San Jose is full of atmospheres and daily histories that will serve as a vast menu of moments and places expecting to be drawn. Applying the concept of “freezing time”, the workshop will focus in the small details that might happen unnoticed, but that integrate a major gear that gives place to a living organism: THE MARKET. We will explore it from the inside out, to deal with its borders and the way they relate to the city around it, complementingit with its frantic internal activity. Discovering stories: explore and witness how store owners solve their business needs and issues by interacting with their clients using graphic bounding boxes as comic strips to narrate events. Going from the inside out: find the connections between the market and the city that surrounds it, through sounds, smells, light and paths. Getting to know the borders: walk around near streets and discover how the city and the market help each other exist. $60.00 USD, Payment can be via internet transfer or PayPal. Cancellation Policy: All fees are fully refundable if cancelled prior to 16 March 2015. If cancelled after 16 March, a $20.00 USD cancellation fee will be retained. In the event of too few registrants, all monies will be refunded. William Cordero A graduate of the “Universidad de Costa Rica”and Professor of its school of architecture is currently working as an architect in this institution and as a teacher in the “Taller de Diseño” (Design Workshop) class. Interests include painting, graphic expression and architectural drawing applied toarchitectural design. 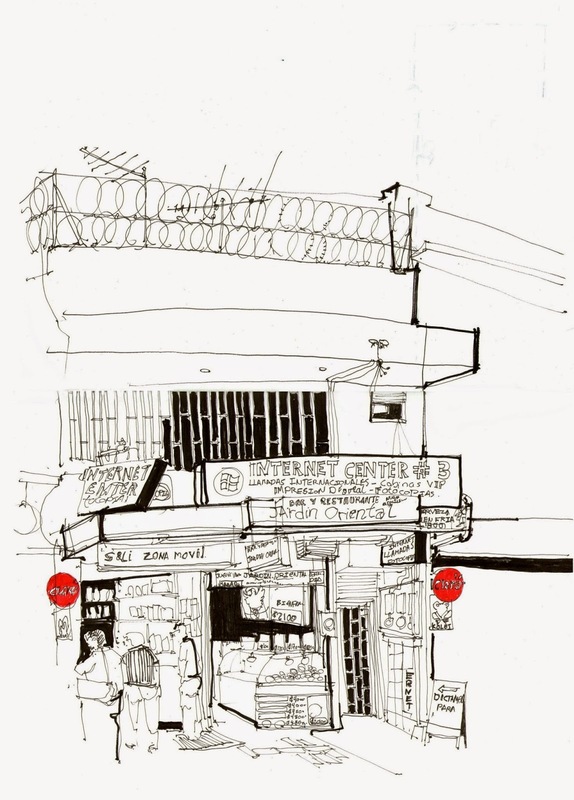 Hehas participated in the International Urban SketchersSymposiums of 2012 (Santo Domingo, Dominican Republic) and 2013 (Barcelona, Spain), and as an instructor in the 2014 Symposium in Paraty, Brazil, conducting the "Bounding Boxes, space and people as characters" workshop. He is also a graphic correspondent for the USK Costa Rica Blog, and co-administrator of the Urban Sketchersfacebook group / in Spanish.